A view from the Sky Walk of the Petronas Twin Towers in Kuala Lumpur. The towers are a must see if you are visiting KL, and access to the Sky Walk is free; a great day out for the budget traveler. 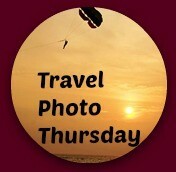 Travel Photo Thursday…The children to Mabul Island, Borneo, Malaysia will warm your traveling heart. One of Malacca’s signature dishes; Chicken Rice Balls.